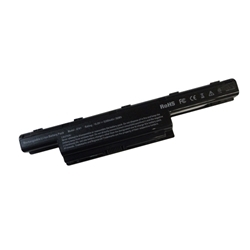 Description: New aftermarket Gateway notebook battery. The specifications for this battery are 5200mAh, 10.8V, 6 Cell. Compatible Part #'s: AS10D31, AS10D71, AS10D3E, AS10D41, AS10D51, AS10D61, AS10D73, AS10D75, AS10D81, 3ICR19/65-2, 3ICR19/66-2. Gateway NE46R, NE51B, NE56R, NE71B, NS41, NS51, NV47H, NV49C, NV50A, NV51B, NV51M, NV52L, NV53A, NV55C, NV55S, NV56R, NV57H, NV59C, NV73A, NV75S, NV76R, NV77H, NE722.